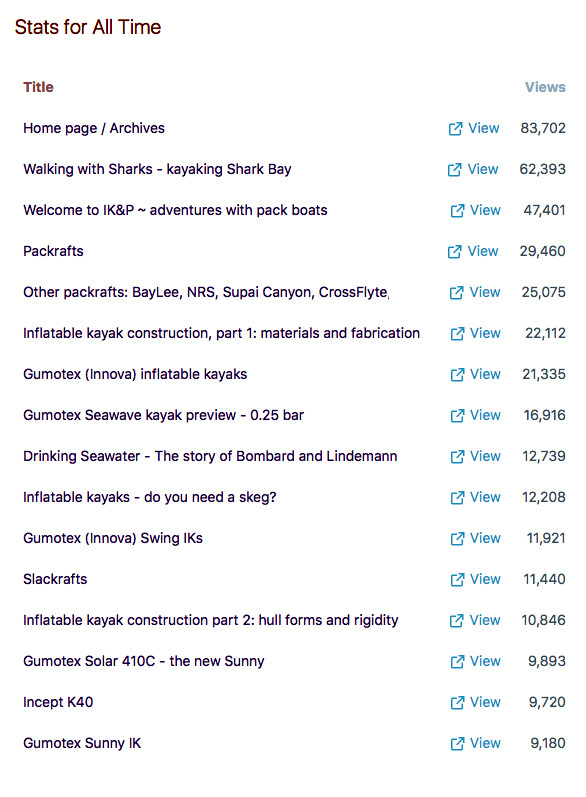 This weekend IK&P went supernova and broke through the one-million hit barrier, making it possibly the most read non-commercial website about inflatable kayaks and packrafts. Find a niche and they will come, as the bloke from WaterWorld is said to have said. The last time I congratulated myself on being such an internet hit was in 2011 when I reached 50,000 hits. 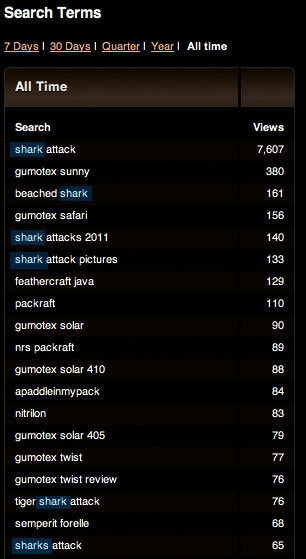 Back then visitors seemed preoccupied with sharks and shark attacks, as the all-time Search Terms table on the right shows. 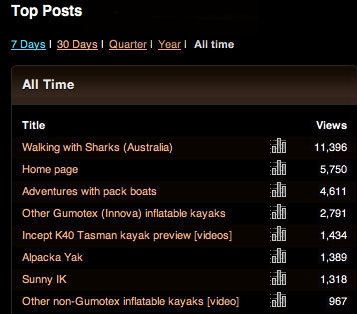 I always assumed the only reason they’d even stumbled over this blog was because they’d been lured in by my most read post: Walking with Sharks – about kayaking in Shark Bay, Western Australia with my Gumotex Sunny. At 380 hits or 5%, that was the top search term about actual IKs. 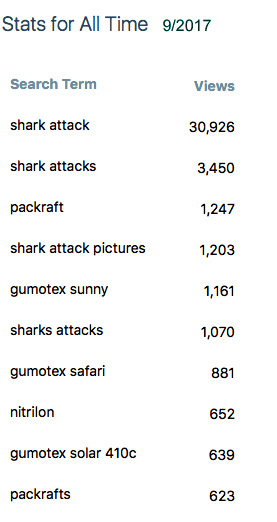 Interestingly, the top real search is now ‘packrafts’ which have caught on in the last few years, but the long defunct Gumo Sunny is still in the top five, who knows why. The most read pages (left) apart from the front page is… SHARKS!! [Walking with…], followed by Packrafts (also walking with) and a few technical and boat review posts, plus my Bombard post. It took days to write that one. Thanks to all you shark fans for visiting IK&P. See you at two mil. This entry was posted in Alpacka Yak, Cheap PVC 'slackrafts', Gear, Gumotex IKs, Gumotex Seawave, inflatable kayak sailing, Inflatable Kayaks, Packrafting, Scotland, Tech, Travel Reports and tagged alien shark invasion, apaddleinmypack, asharkinmypack, bikini babes attacked by sharks, how to survive a shark attack, I married a shark, Is that a shark in your pocket, kayaks ripped to shreds by mostrous sharks, loan sharks, red hot shark on shark action, rental sharks, shark attack kayak, shark attack!, shark attacks, Shark! Aah Haa Saviour of the Universe, sharks attacking everything and everyone, sharks for hire, sharks up my u-bend, they call me Shark, Walking with Sharks, you'll find no sharks here. Bookmark the permalink.